Jake is the pioneer of personal training in America. He has become known as America’s leading fitness motivator, a best selling lifestyle author and the founder of the Don’t Quit Foundation that empowers kids through physical fitness. 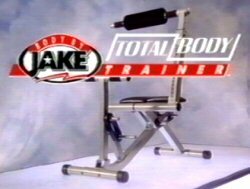 Body By Jake Total Body Trainer is a compact home work-out gym, developed by Jake, it is said to do everything the larger home gyms can do but on a much smaller scale. Such as: Strengthen your arms, Sculpt your back and shoulders, Define your chest, Firm your buttocks and thighs, Give you rock hard abs - All while you sit on a comfortable cushioned seat. The Total Body Trainer consists of a tough tubular steel frame and comes with a work out guide, rubber power bands (acting as weights) and a 1year warranty. It’s Easy to use – there are no complicated adjustments. It’s quick to assemble. Power bands offer 10 different levels of resistance from light toning to serious strength challenge. One pin positioning which adjusts to your height. Lightweight to move from room to room and easy to store in your closet - plus it’s whisper quiet so you can listen to your favourite music or watch the television. 3 million people have put their trust in Body by Jake products.